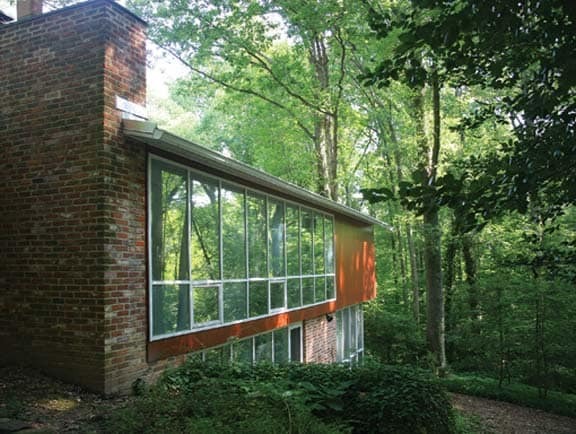 The Hollin Hills Historic District is a nationally significant example of Postwar residential development by renowned modernist architect Charles M. Goodman and developer Robert C. Davenport. The historic district is composed of the entire 326 acre neighborhood, capturing the 1946 and 1956 development phases that continued until 1971. The subdivision plan has irregularly shaped lots that embrace the natural topography, winding streets and cui-de-sacs, and communal parks and woodlands that provide shade, privacy, and outdoor space. When detailed study of the needs of contemporary life is unhampered by dogma, architecture evolves new forms. . . .
One of the most identifiable facets of the houses is the contiguous series of floor-to-ceiling, 3-foot-wide window modules, which are free of traditional ornamentation. The modern designs were covered by low-sloped gable roofs with overhanging eaves, flat roofs, or butterfly roofs (low-sloped V-shaped roofs). The shallow pitch of the roofs ensures horizontality, allowing the buildings to lie within rather than on top of the landscape. Other distinctive exterior elements include reclaimed brick, and horizontal or vertical wood siding painted in earth tones. Also of note is the shared natural landscape, with a lack of fencing or other delineation of property lines. The key features of Goodman's original designs endure today in the 480 houses and 30 acres of park land of Hollin Hills. The common architectural style has been protected by architectural covenants drafted into the deeds of dedication subdividing all the lots in the neighborhood. 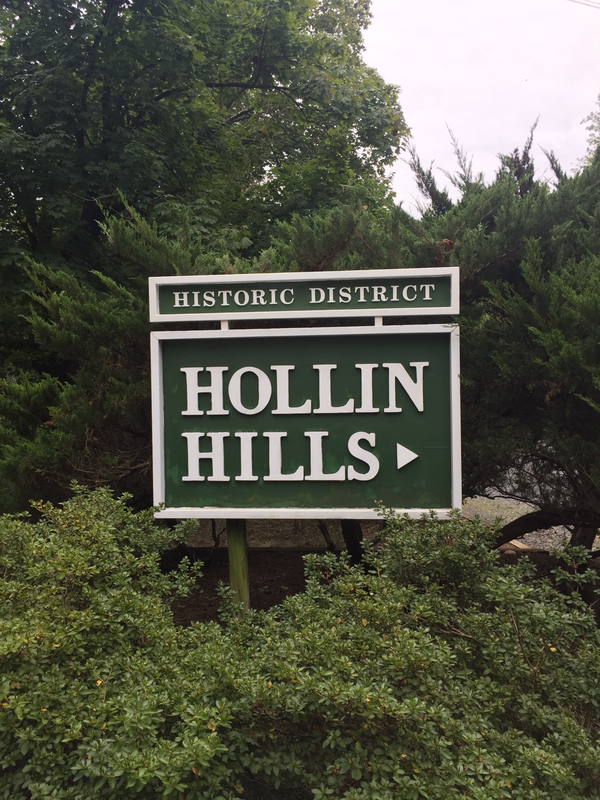 The covenants provide for review of designs for external renovations, additions, and other structures by a committee of the Civic Association of Hollin Hills composed of Hollin Hills residents. The Design Review Committee follows published guidelines, and ensures that designs are consistent with Goodman's original modern designs and continue to embrace the natural topography of each unique lot. More information can be found on the Civic Association's website.